We recently spoke with Matthew Jurecki, BS, RRT, Program Coordinator of Respiratory Education at a large, leading academic medical facility. Matt relates that the RespiSim® System has helped his facility overcome training challenges that were previously problematic. Matt says that the RespiSim System becomes more valuable to his facility every year, because they continue to expand its use in their training program. In addition, Matt says that by using the RespiSim System, his learners become more aware of real-world respiratory issues, improve their skills, and increase their beside confidence. 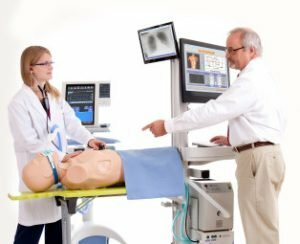 The RespiSim System allows learners to train on ventilator management and safely experiment with the different modes and settings without putting real patients at risk.